Deceptively spacious mini designer make up purse with gusset, ideal for those make-up essentials in your handbag. Plastic coated sturdy design with a practical wipe clean PVC lined interior and zip fastener. Beautifully finished off with a heart charm and pink bow detail. Ideal as a gift for teens and girlie girls! 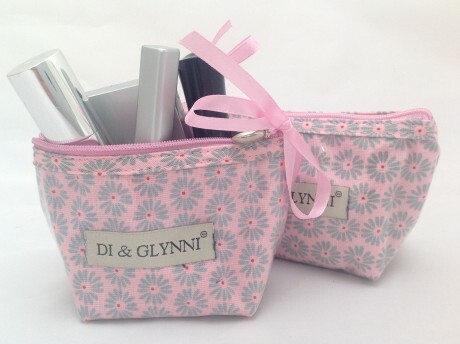 Part of the Di&Glynni range of cosmetic and toiletry bags from South Africa. See matching 'Daisy' Cosmetic bag and Wash bag.